Outsiders don’t realize it, but project management is a creative discipline. The nature of our work means we are constantly discovering new problems to solve. So, this means that among a long list of other skills, you must also master creative thinking. But this can be a challenge. Creative moments appear to come, unbidden, at odd moments. Often, it’s when you are least focused, when your brain is far from its sharpest, and when you are least prepared to give careful consideration to your ideas. This is hardly the ideal set-up, but it seems to be the way our brains are wired. How on Earth can you “master” that? It turns out that there is plenty you can do to encourage creative thinking for you and your team. So, if you want to become more consciously creative, change how you think, and deliver more and better ideas when you need them, read on. 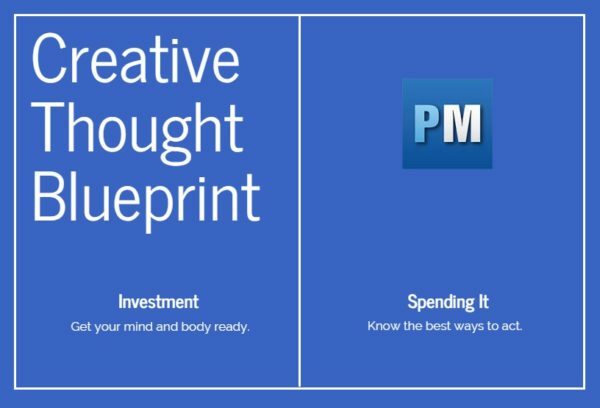 Investment: doing the work to prepare your mind and body to be creative. This may sound difficult, but none of these tasks takes a lot of effort. But they do require your attention. Spending it: the best way to let your creativity flow. We’ll look at five techniques to encourage your creative ideas to emerge when you need them. We’ll start by looking at five ways you can create the right mental conditions to generate maximum creativity when you need it. If there were just one thing you could do to improve your creative thinking, this is the one I’d point you to. Curiosity is the master-attitude for discovery, learning, and creativity. It’s the insatiable desire to learn more. And, the more you learn, the more connections form in your brain. So, cultivate curiosity. Always be wondering, questioning and finding out stuff. Take nothing on face value; investigate everything. Find out how things work and why they do what they do. Never be satisfied with your state of knowledge. Creative ideas most often come when our brains link two, previously unconnected ideas. The more ideas, the more possible links. But curiosity also means you are more likely to inquire deeply into the problems you want to solve. If you ask more questions, you’ll get more answers, gain more insight, and increase the chances of a creative solution. Creative approaches to project management, such as design thinking, are embracing this different approach. Given a problem, ask why it emerged. Take any answer you get and ask, again, “Why?” Keep going and eventually, you’ll form hypotheses about the causes that you can address. It may not feel like creativity, because it follows a process. But that’s how to master creative thinking: by using tools that work. Another aspect of preparation for creative thinking is to roam intellectually across all the continents of knowledge. Take an interest in anything and everything. It’s the connections that you can form that lead to creativity, so more diverse knowledge means more diverse connections. Often, the ideas we perceive as “most creative” are the ones that at first seem unrelated to the problem. They appear to take a “sideways leap,” one that psychologist Edward de Bono termed “lateral thinking.” So you need to create plenty of sideways room for your ideas to leap into. Don’t lose your ideas: note them down. And while you are noting them down, develop them. And when you need inspiration, go back through your notebooks. I counted. On the shelf behind my desk are 37 notebooks. OneNote, Evernote and the like are great, but nothing beats 20th century technology: pen and paper. But I also have hundreds of pages of OneNote notes too! When you need an idea quickly, where will it come from? Articles, clippings, pictures. Keep them all in a file of ideas that you can go to when you need them. At the moment, I have two physical files (one neatly organized and one full of the stuff that I haven’t organized for over seven years). It’s the latter that offers greatest inspiration. I used to paste paragraphs into OneNote, but now I have started using Pocket as a digital tickle file for stuff I find on the web. As a writer, I have recently transitioned all of my writing projects to Scrivener. This is a notebook, project file, tickle file, word processor, publishing tool in one. I’ve fallen in love with a piece of software! Chill, relax, unwind, rest. If you don’t do any of this, your brain will turn to mush. We know that we are at our most creative when we are in a liminal state, between sleeping and waking. That’s why so many creative ideas come to you shortly after you get up in the morning, or at the very end of your day. I tend to write articles son after getting up, for that reason. But there is a limit to how tired you can be and still remain in any way effective or creative. If you aren’t getting enough sleep, first your ideas will be creative, then they’ll be crazy, and finally, you’ll barely be able to think. Now’s the time to turn on your creativity. If you’ve made the right investments, it will be ready to flow, so how can you channel it to where and when you need the ideas to solve a problem quickly? Maybe you have seen or read about a Hollywood writers’ room. This is where scriptwriters gather to pitch and develop creative ideas for storylines or sketches on US television shows. It shouldn’t be a surprise that these have many of the essential conditions for enhancing creativity. You need to feel comfortable, so go to somewhere full of comforting, interesting and random stuff, with a variety of chairs and zones, so everyone can feel in the right zone for them. Your environment should offer plenty of simple stimuli, to trigger ideas, but not so much clutter that it becomes a distraction form your task at hand. I’m not sure whether snacks and fruit make a difference one way or another. But it is certainly true that your brain works best when fully hydrated. So, have plenty of water available. The right environment and the presence of “toys” and prompts to play with can stimulate your sense of fun and help get the creative connections flowing. But I’m not a fan of “forcing the fun” to try to transform the mood with a bunch of toys. Playfulness is a social attitude and it happens when people are comfortable with one another. You can boost this atmosphere by allowing people to riff off each other’s ideas, rather than allowing them to be critical too early. To be creative, you need to feel safe. If we are all the same, we all think the same. A diverse group of people to bounce different ideas around and to interpret each one in a dozen ways will find the maximum number of possible connections. So, the more diverse your project team is, the more creative it is likely to be. But recall the point I made in the last section. If people feel uncomfortable, their creativity will dry up. The challenge for you, as project leader, is to build a supportive environment where people respect one another’s differences. There is a difference between a dreamer and a realist: a realist focuses on what is and is therefore not creative. Both have value on a project team. Ask what could be and it’s the dreamer’s answers you want. When you have the right dream, invite the realist to assess how to get there with the resources available. If they get stuck, the dreamer may be able to figure out what resources could be available. The dreamer-realist interplay is the source of innovation: creativity + implementation. Only when they’ve done their work should you invite in the critical thinking that validates your plan. Don’t relax too much: necessity is the aunty of creativity. When we feel under pressure, we work harder and reach deeper into the recesses. Give me a topic or, better still, a title, and I’ll write you 1,500 words in no time. But ask me for a 1,500-word article…I’ll spend half an hour or more just trying to find a topic! If you have a boundary, your creativity can press against it, and burst out. Thinking creative is only the start, of course. The genius Leonard De Vinci couldn’t paint the Mona Lisa with his mind. He needed pigment and brush. ProjectManager.com is the cloud-based tool that takes your creative ideas to productive fruition. See for yourself with our free 30-day trial.